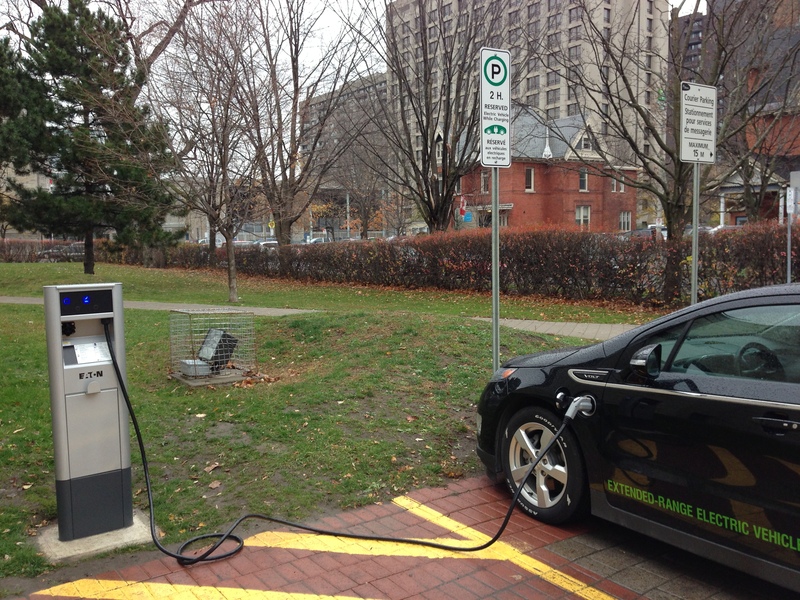 Public Charging Stations in Ottawa. Finally! 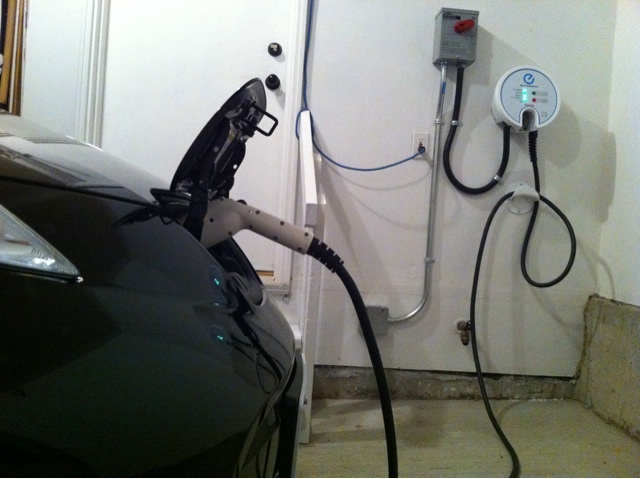 When we first got our Leaf a year ago, charging infrastructure in Ottawa was non-existing. 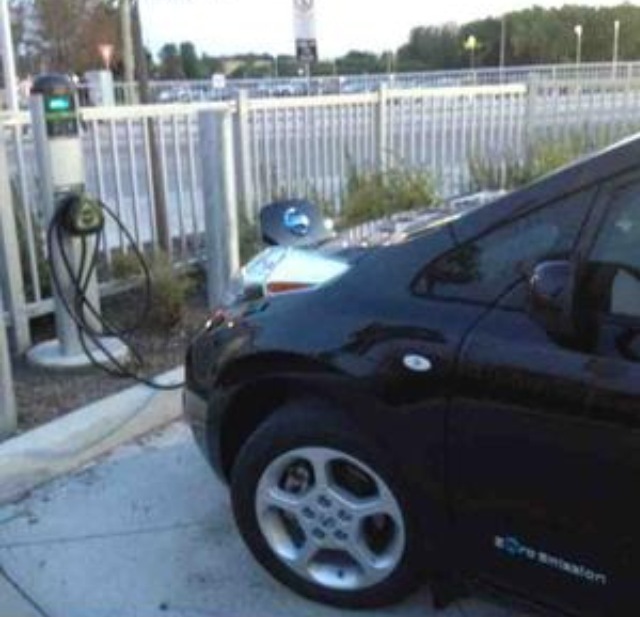 The only known “public” Level 2 charging stations in the area were the ones at a public parking lot at Aberdeen Road, but they were all reserved for Adobe employees. One year later, Ottawa is still far behind other municipalities like Montreal and Vancouver, but the situation has improved quite a bit over the summer, culminating on this week’s announcement of a pilot project by Hydro Ottawa and the installation of a public charging station at City Hall. 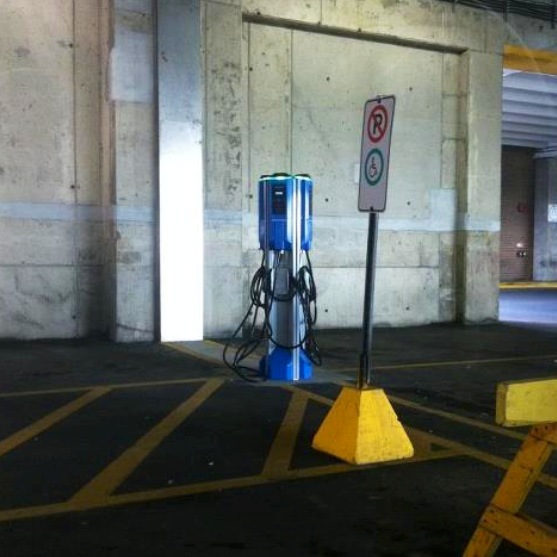 Here’s the list of all Level 2 public charging stations currently available in Ottawa, in chronological order, plus a little bit of history behind each station. Exact locations can be found in PlugShare. 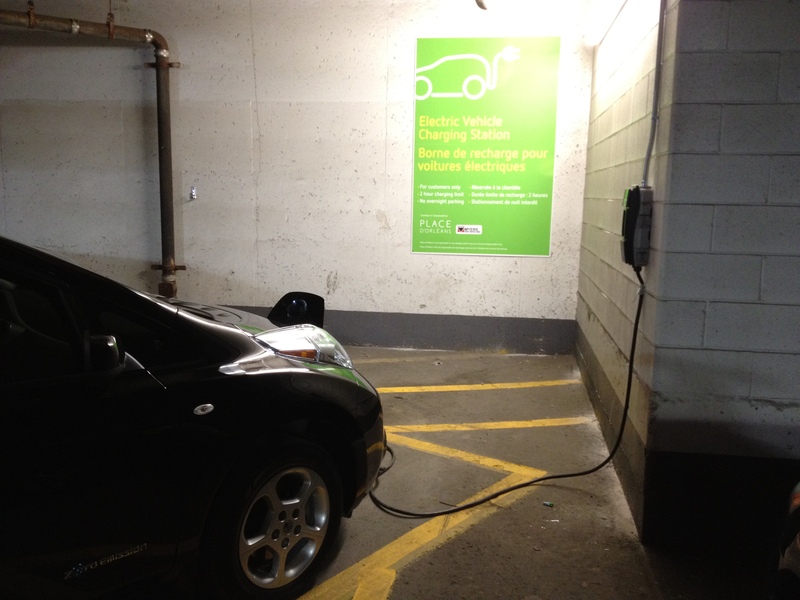 Place D’Orléans was the first to install a public charging station in Ottawa back in July. The station was a collaboration between the shopping mall and a nearby GM dealer (Myers Orléans), a perfect partnership since the mall can attract EV owners while the dealer can advertise and sell more Chevy Volts. Customers can charge at no cost for up to 2 hours and the parking spot is well marked for Electric Vehicles, with the asphalt painted in green. There are also adjacent spots that can be reached by the charging cord if you get ICE’d (blocked by an Internal Combustion Engine car parked at the EV-only spot). It wasn’t until September that we discovered a second public charging station: a ChargePoint station at the Algonquin College at Woodroffe Avenue. It wasn’t clear how long that station had been there, and to this date ChargePoint is yet to show it on its map (I already opened a support ticket with their help desk), but the station is operational and I already charged there once using my ChargePoint access card (at no cost). The Science and Tech Museum is where the Electric Vehicle Council of Ottawa (EVCO) meets every month. The museum has always had electrical plugs available for electric cars visiting the museum but they were all 120 V outlets and there were no reserved parking spaces for EVs near these outlets. This changed in October 19th when Sun Country Highway officially unveiled a 90 Amps Level 2 charging station at the museum parking lot. Sun Country Highway donated the station, EVCO provided seed money for the installation, and the museum provided the parking infrastructure and electricity while complementing the installation costs. 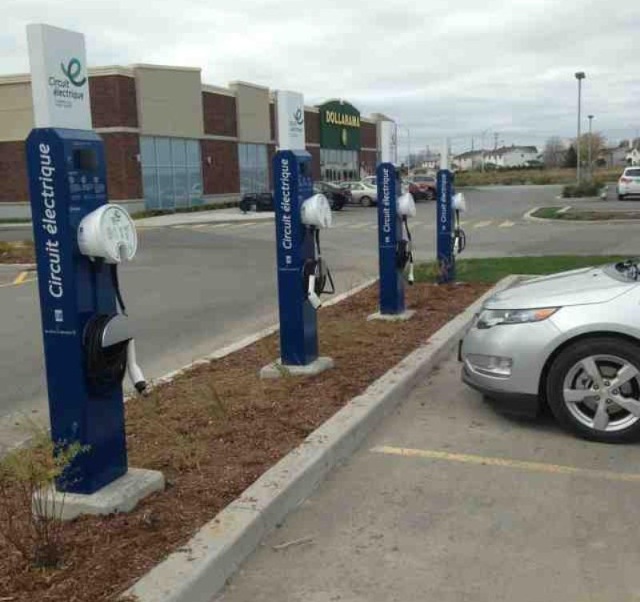 Les Galleries de Hull officially announced four EV charging stations for clients in October 25th. The stations have been active for testing since October 14th. They are managed by VER network/AddEnergie and require a “ReseauVER” access card, though if you call the number on the station they will activate the charger for you. The status of each station can be seen online at the VER network website, if you have an account. Charging is currently at no cost but this may change in the future. 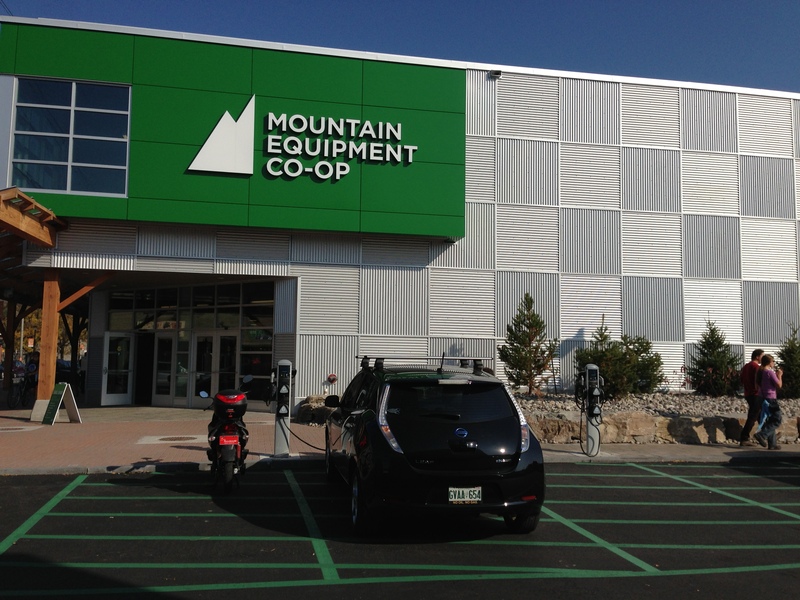 Four charging stations became available for MEC customers on October 26th after a long period of renovations at the store and at the parking lot. The stations had been covered with black plastic bags for a long time, and we were all curious to know which kind of stations they were, and how many ports they had per stall. We now know these are ChargePoint stations, two J1772 ports per stall, and require a ChargePoint access card but are free once activated. Hydro Ottawa and the City of Ottawa have started a six-month pilot project to better understand demand and service costs. 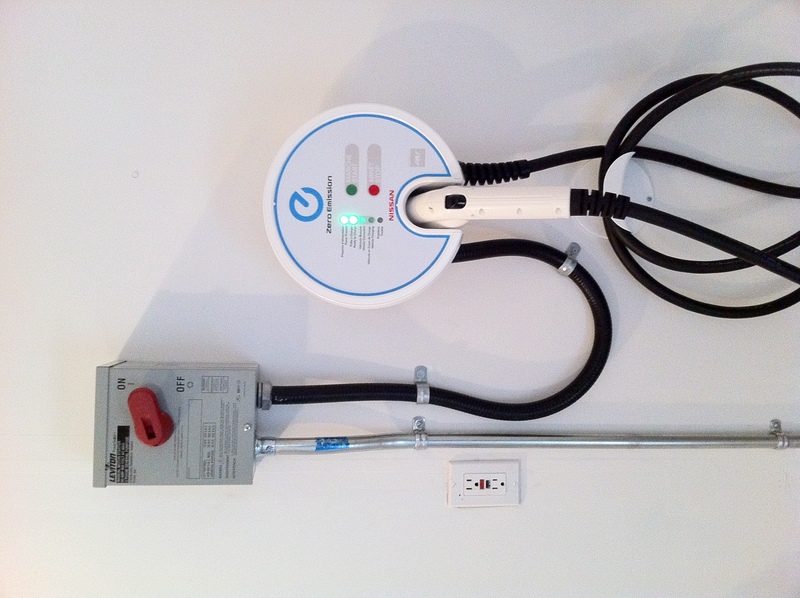 A Level 2 charging station is available for EV owners at no cost with charging is limited to 2 hours. The Eaton station was unveiled in an event at City Hall with a fair amount of media coverage. As I was writing this, someone in PlugShare reported that the first Electric Circuit charging stations in Gatineau are now installed! This was quite a surprise since the estimate Electric Circuit gave me last week was end of November. I’m not sure if they are really online or just put in place. I need to go and check. In any case, it’s a really good addition for us. It’s one of the farthest Level charging station reachable from my house so it will significantly extend my range on trips to the province of Quebec. 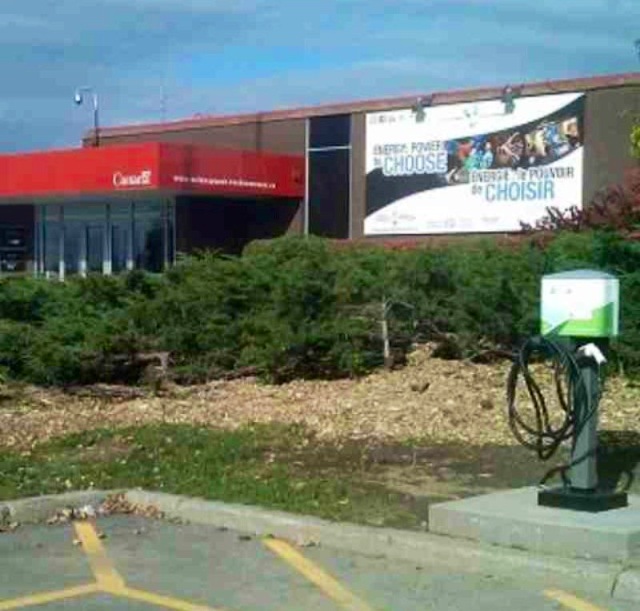 The City of Ottawa has announced plans to upgrade at least two of the existing Level 1 charging outlets at the Goulbourn Recreational Complex to Level 2 stations. Similar charging stations are expected to be installed at the Barrhaven South Recreation Complex currently under construction. The Electric Circuit is making inroads into Ontario, in a partnership with Plug’n Drive. Hydro Ottawa is also involved in the talks since the first roll-out will be in the Ottawa-Gatineau region. We should be hearing more about this early next year. The Electric Circuit is also expecting to install the first DC Quick Chargers next year. I’m hoping they choose highway 40 between Ottawa and Montreal as the first location for deployment, since that will make practical to travel between the two cities. 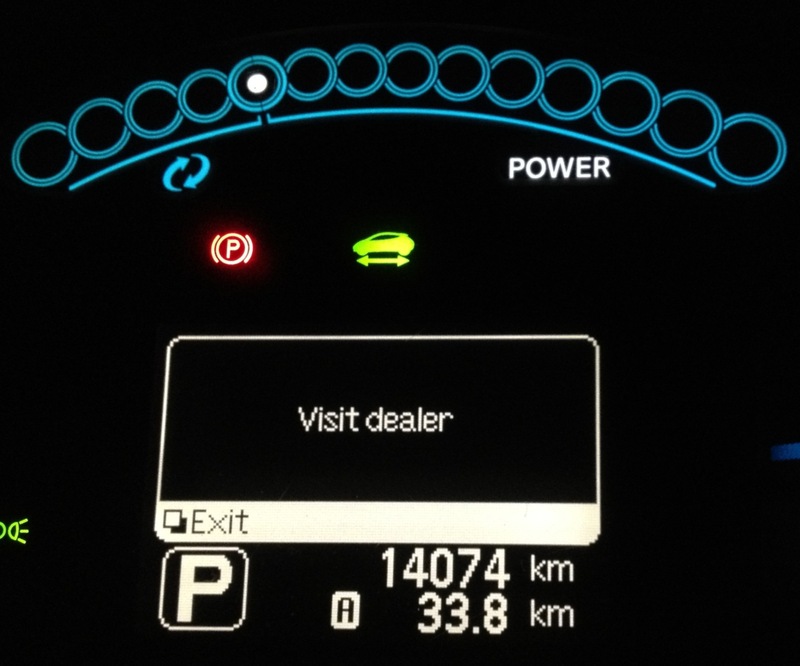 KWh-meter display after a quick charging test, showing 0.3 KWh used. No more guess work on how much electricity we’re using with the Leaf. Today we had a KWh-meter installed that is going to show how many KWh are being consumed by our Charging Station. So far I’ve been doing all the measurements using a combination of manual logging of charging hours and reports from the smart meter in our house. None of the two are very precise. They only give us a rough idea of much is being consumed. With the KWh-meter we will be able to tell precisely how much we’re spending each month in electricity. The meter doesn’t measure how many dollars are being spent, just how much energy is being consumed. We still need to multiply the measurement by how much we’re paying for the KWh, but the price varies depending on when we charge. This is because we have time-of-use rates, with different prices for different times of the day. We charge almost exclusively during off peak hours, at a rate of 12.8 cents per KWh, all included, but I’ll still need to keep track of any eventual mid-peak or on-peak charging to get a more precise dollar amount at the end of the month. Luckily, these have only happened during the winter so far. 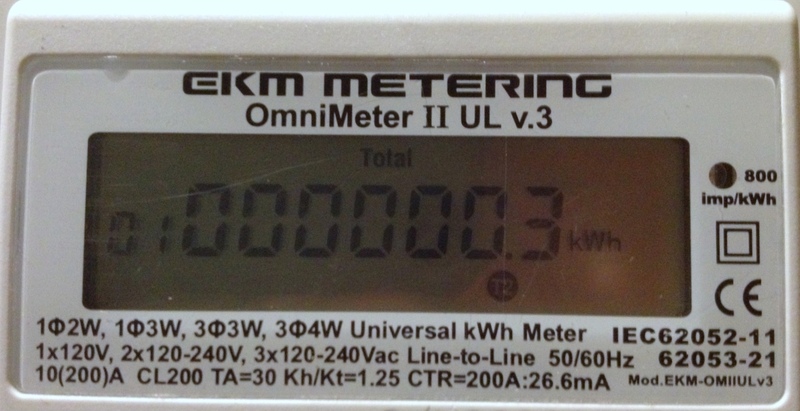 The KWh meter is manufactured by a company in California called EKM Metering. The unit I purchased is one recently UL-certified for use in Canada (electricians will normally refuse to install any non-UL certified equipment around here). 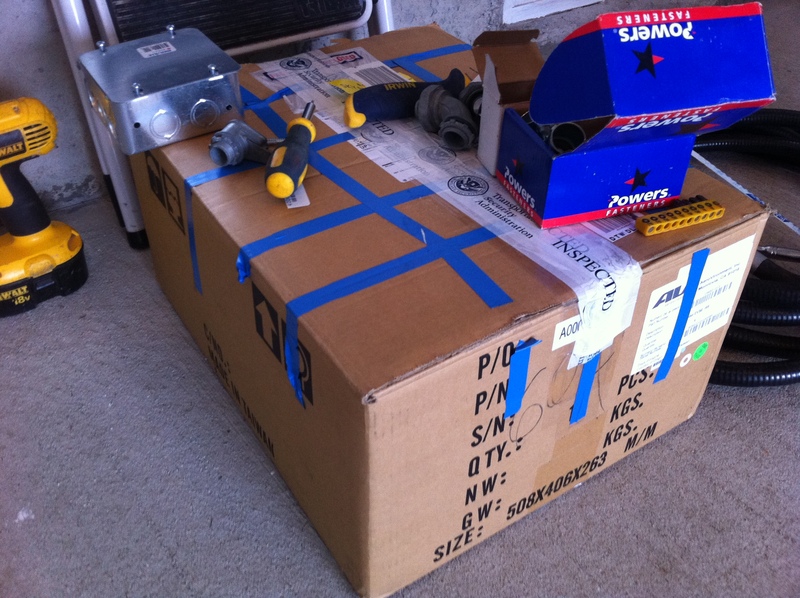 I had to wait quite a few months for the certification process, but once the unit was available, shipping across the border was quite fast, with no extra fees other than the S&H. The only caveat is that you have to order the enclosure and the required CTs (current transformers) separately. The meter also has a serial interface for remote reading by a computer. You’ll need a special RS-485 to USB converter, which EKM sells for $20. I haven’t hooked it up yet but I will in the future. They also have software available and it’s free. The Leaf is finally home! Delivery day report. 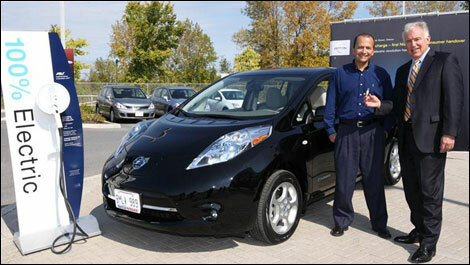 I took delivery of our Leaf yesterday from the hands of Allen Childs, president of Nissan Canada. It was a busy day, but also a very fun and exciting day. The event received a lot of media attention. I gave interviews to several local radio stations and newspapers. The main newspaper in Ottawa, the Ottawa Citizen, published this story on the front page of its Business and Technology section. There was also a story on CBC News, Auto123.com, several news segments on CBC Radio and CFRA, and short news story on TV at CTV News. 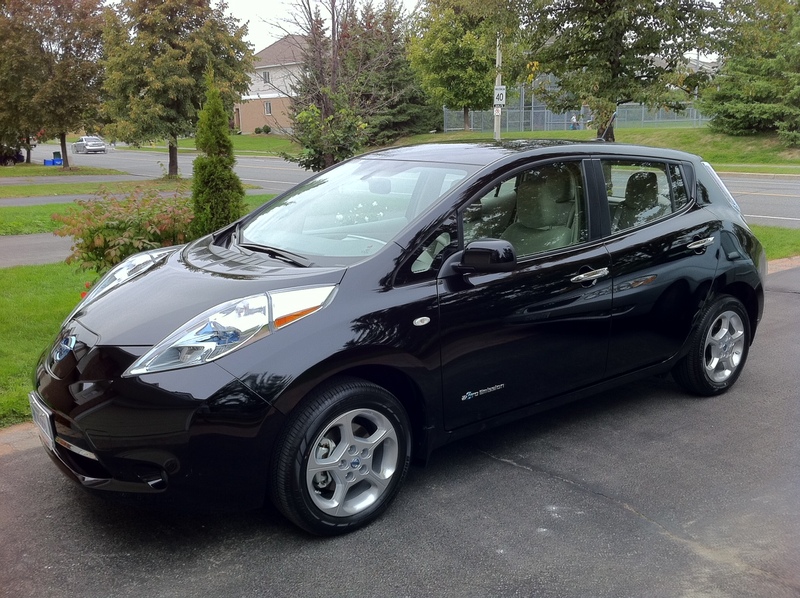 I drove our Leaf for the first time with Allen Childs as a passenger. Then I took my family for a ride. Then I gave more interviews. Then we went home. – Estimated range went up from 51 Km to 135 Km, or 84 Km. 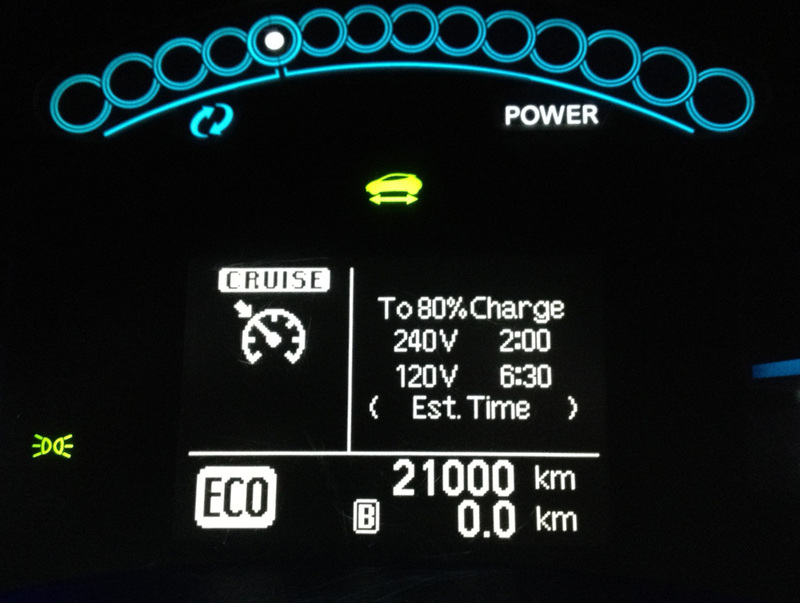 Our Leaf finally recharging at home. Now, that’s quite amazing. 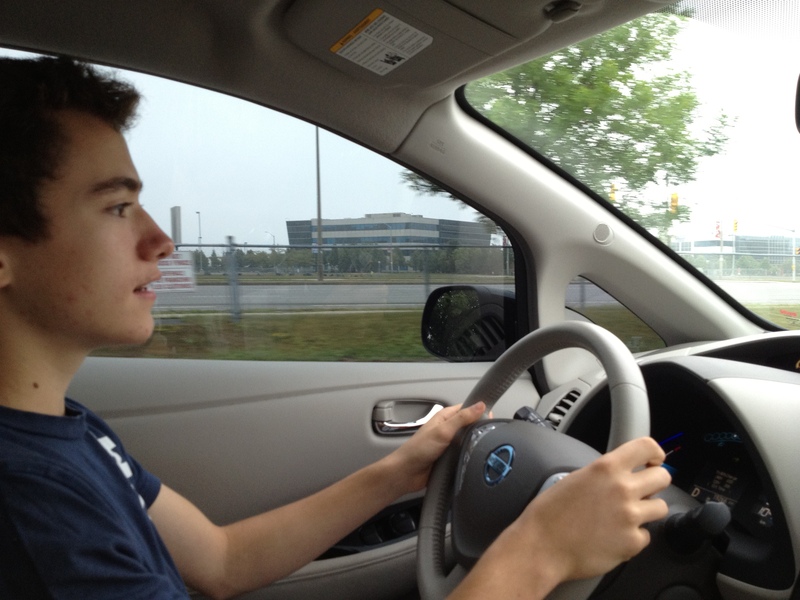 For less than a liter of gas, I can drive 84 Km. In the city! I think the estimate is a bit optimistic though. 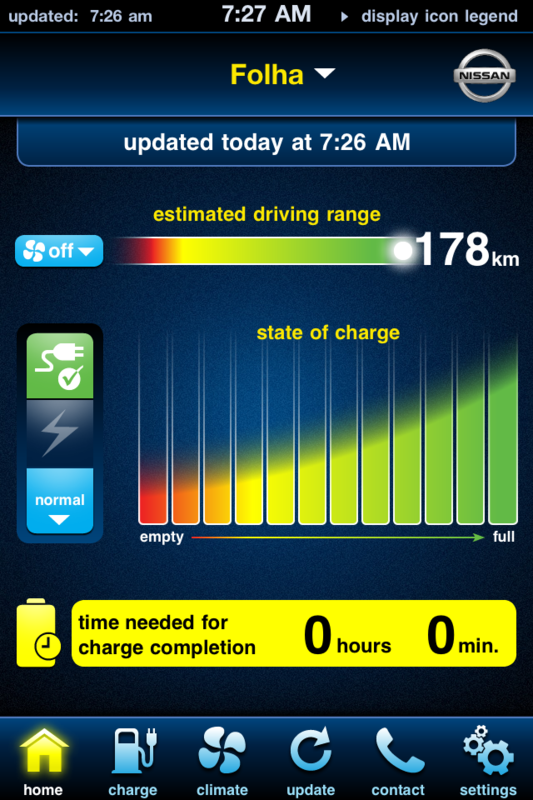 Given my average of 7.6 Km/KWh, that charge should actually give me 74 Km, which is still very very good. I should get more precise numbers in the next few days, after a few full recharges. As for the iPhone app, it works really well but don’t expect fast responses. You’re not talking to the car directly but through a central server. Update requests take about a minute to receive a response from the car. ECO mode is sluggish but I’m starting to make sense out of it. It drives as if you had five heavy people in the car and lots of luggage. It gets to the speed you want but accelerates much more slowly than what you’re used to on the Leaf by default. On the other hand, the acceleration is very similar to a small gas-powered car, so you’re not making any people behind you crazy. It’s worth getting used to it because it saves a lot of energy, and you can always click it back to “sport mode” when you need it. One thing to watch for in ECO mode: the regenerative breaking is very aggressive. That means you rarely have to step on the break when getting close to a red light. That’s great for recharging the battery but remember the person behind you will NOT see any break lights while you’re decelerating so make sure there’s enough room between you and the car behind you. Today I drove another 82 Km and ended the day with a 67 Km range, or 4 bars. A full recharge was estimated to take 4.5 hours but took a bit more than 3.5h. The hydro report will be available tomorrow. This is Eric from AeroVironment. He flew all the way from Atlanta to bring our charging station through customs and make sure it got installed in time for the delivery of our Leaf this week. I was really impressed. It really shows how serious AV is about this business and how successful they want the launch of the Leaf in Canada to be. Eric is holding a test jig that will be used to test the charging station after it is installed. This is particularly important because we’re yet to have the Leaf in the garage so we can’t test it with a real car. 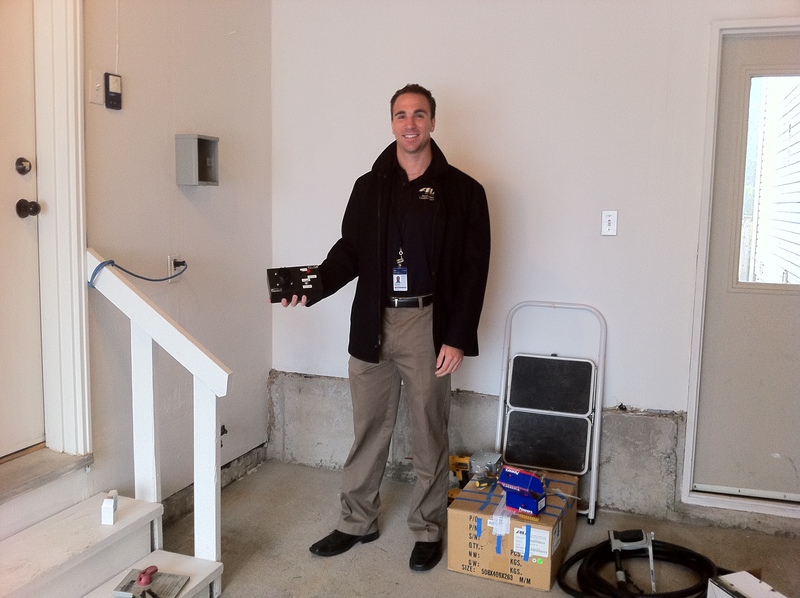 The charging station was still in the box while Scott, a local contractor from Ottawa, trained and certified by AV to do the installation was already busy working down at the basement. Things went really smoothly and uneventful. The two guys knew exactly what they were doing and I could even go to the office and do some of my own work while they were busy doing their stuff. The installation took basically the whole morning. When I got back home at lunch time, the charging station was ready to go and Eric was able to do a quick training session. I thought it would be a good idea to capture his tutorial on video so I could share with the others in the Leaf Owners group. Youtube link coming soon. 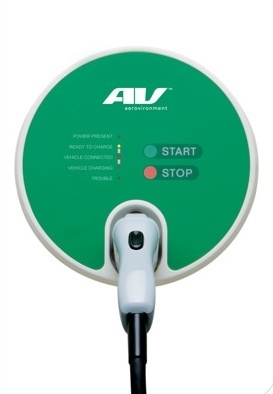 The best way to describe my experience with AV is “piece of mind.” I did a fair amount of research on other charging stations, with the help from other future Leaf owners on Facebook. I had an electrician come over and give me an estimate for the installation, but things were not very simple. He would have to see the actual station before he could tell me exactly how much his work would cost, and his ballpark estimate wasn’t too far from the quote I had already received from AV. I was also reluctant with the warranty, and who to go for technical support in case I had problems. Finally, I didn’t think I would be able to get it done in time for the delivery of the car… All these issues disappeared once I asked AV to do the work. It was one of those “set it and forget it” things. They took care of everything in record time. They hand-carried the charging station to my door, had a fully-trained electrician to do the work, even took care of the final inspection. They basically turned something that would be very complicated for me into something very very straight forward. AV did our home assessment this morning. It was quite uneventful. Our panel has a lot of room, the wires will only run through the unfinished part of the basement, with direct access to the garage, so the work should be fairly straight-forward. 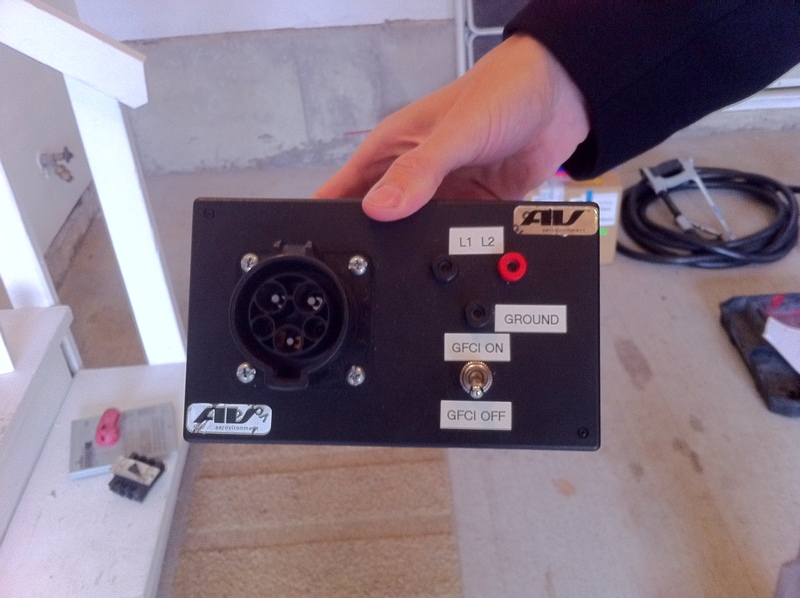 The assessor was a local contractor hired by AV, the same person who installed the two chargers at the local Nissan dealer. He didn’t provide any quotes, not even a ballpark… That will have to come from AV after he enters all the data in the system. He said I should get the total cost later this week. Ready for the home assessment, early next week. Aeroenvironment is coming over for a home assessment first thing Tuesday morning (Monday is a holiday). 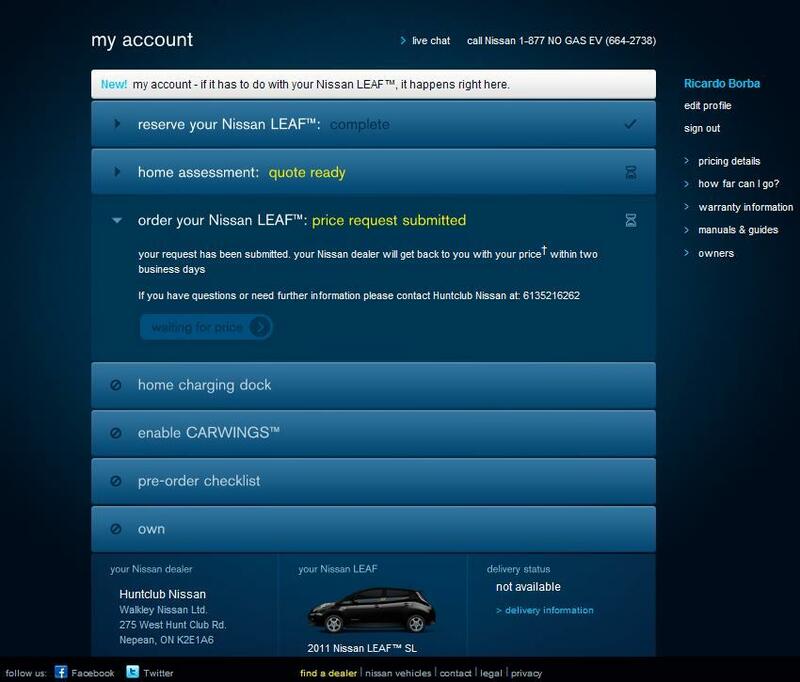 The appointment was originally booked for Sept 13, but Nissan was able to speed up the process, which is great. 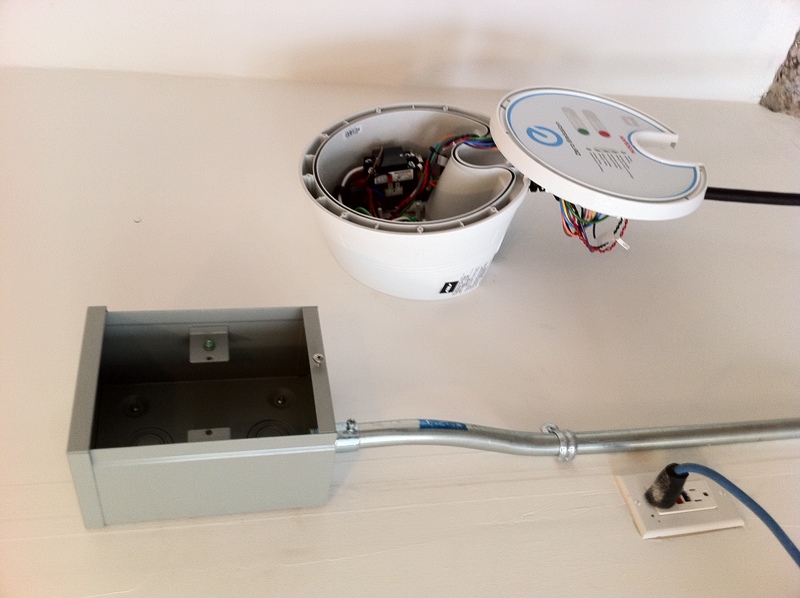 It is important to make sure our house has the right circuits in place to support the charger (it needs a 40A@240V circuit, basically the same as your dryer) and that the wires can be pulled to the garage without any trouble. 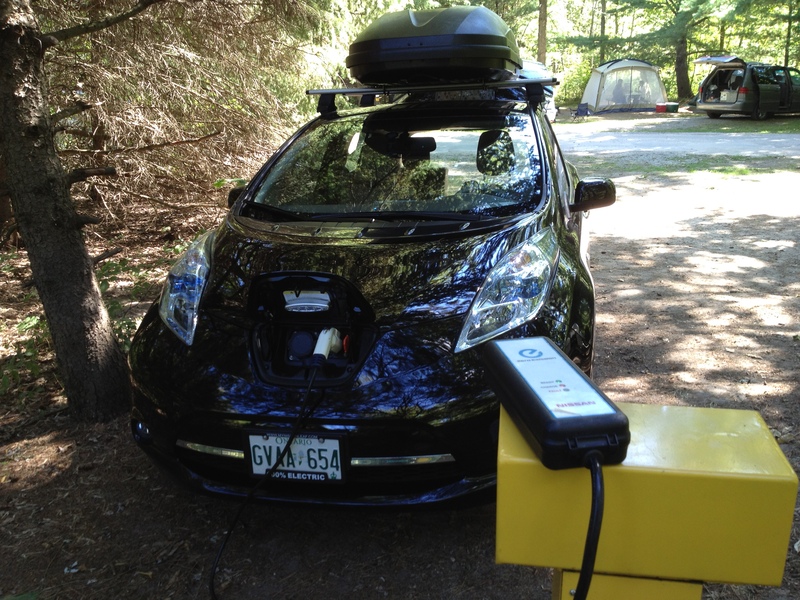 The Leaf needs 3.3KW to charge so in principle we only need a 15A charger. These ones tend to be less expensive. However, Nissan has indicated there are plans to upgrade the Leaf on-board circuit to support a faster charge (6.6 KW), which is standard in the upcoming Ford Focus and requires a 30 A charging station. 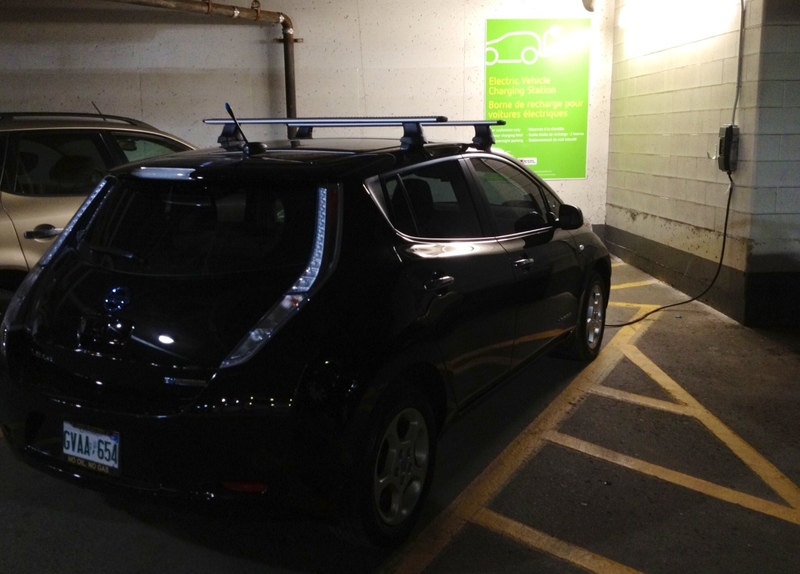 That’s the one Nissan’s EVSE partner Aerovironment is offering to future Leaf owners in Canada. However, there are other charging stations in the market and they all follow the same Level 2 standard, so I’m trying to get a second quote from a different manufacturer/installer. We’ll see how that goes.